Thats definitely a interesting concept i may have to try and incorporate that into my final idea i still haven't made yet, thanks! Is he down on one knee in this? ^ No, she has just whacked him over the head with that book. I likewas it becuaseand That gazebo does look a bit simpler and easier to do, thanks! this is a funny topic. My wife and I went to Hawaii to do our 12 year vow renewal. 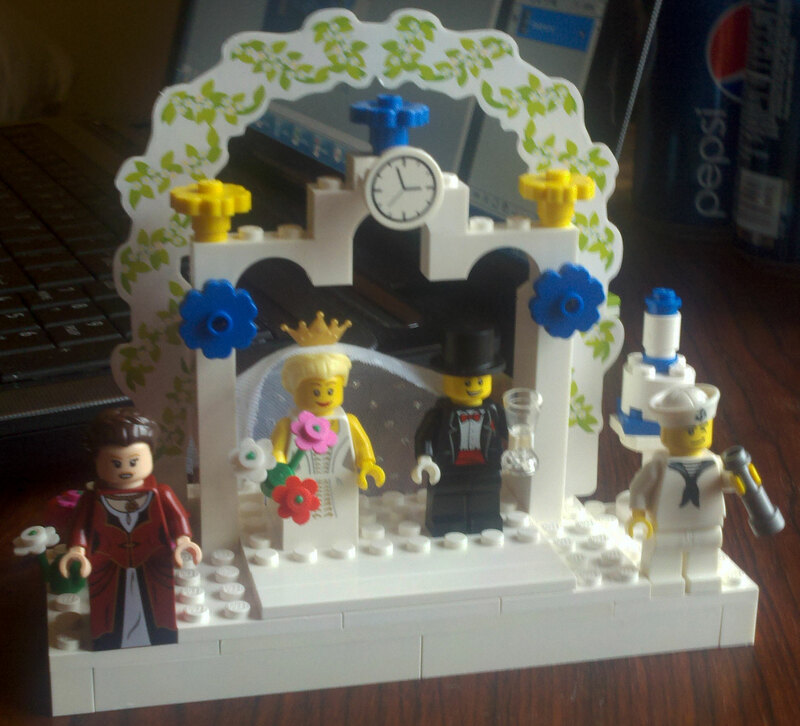 She got me the Lego wedding topper form the Lego store. In the end I made this... a bit simpler than I had originally had thought of in my head but due to time/pieces constraint (had two research papers to write and starting new job). I made sure to add in a Maid of Honor and my best man who just got out of the navy, and a cake in the background (ps: it spins lol). But I am happy with it and maybe during my break next week I'll add on to it. You could add a preacher/justice of the peace. @AFFOL_Shellz_Bellz wow thats a great idea... can't believe I over looked that... now the hunt is on.... for a judge/priest minifigure something to fit the role, Thanks! What is the female minifig in that picture? Looks like Elizabeth from POTC. You could sub the new bride in there too - CMF Series 7. She has a crown and the flowers are a new style - easier to hold. ^^ maesterjay, that is TOO CUTE! I love it! Right. The body wear piece on the bride is custom I think. It's like a swirly red dress that is separate from the torso. Nice.